Design Inc were flattered recently to be asked by long term client Airbus Helicopters to provide a teaser advertising campaign leading up to the big reveal unveiling of the new Airbus Corporate Helicopters (ACH) brand at EBACE in Geneva. The ‘Tailored for you’ concept was developed by Design Inc to promote the totally personal aspect of the new service by showing fine silk fabric partially covering the H logo letter. As well as print and digital executions of the teaser advertising there were animated programmatic adverts, all supporting the launch of ACH on the Airbus EBACE stand. ACH now sits alongside Airbus’ ACJ brand and restates the company’s commitment to providing business and private clients a totally bespoke end to end helicopter ownership experience. Airbus have gone live with a new website and other tailored product and service-based marketing materials to support the launch of ACH beyond the initial teaser advertising campaign. Design Inc has supported Airbus Helicopters with global advertising based on five main helicopter missions (Corporate/Private, Military, S&R, Medevac and National Resilience) for over five years. Our genre challenging campaign has extended two years beyond the original three year media plan and has twice been framed in a reformatted corporate template, firstly when Eurocopter became Airbus Helicopters and then again last year when Airbus Helicopters became branded as simply Airbus. Teaser advertising is a tried and trusted way to establish intrigue and interest in a product or service. 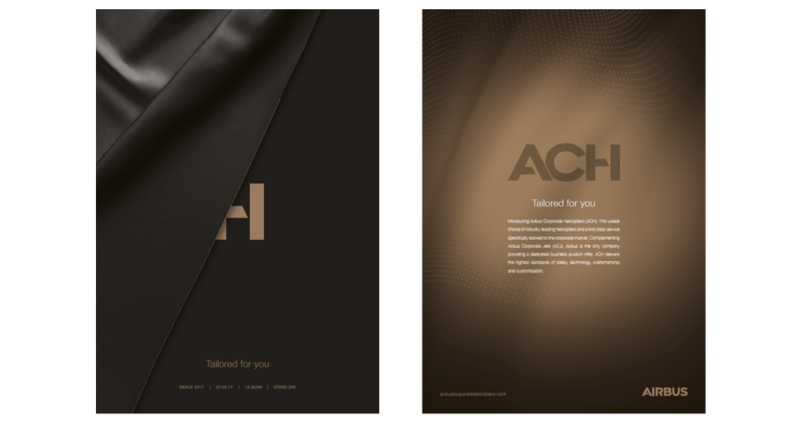 Beyond the unveiling of ACH we are currently developing the follow-up dialogue to take the story and customer journey to the next stage. In addition to working with Airbus Helicopters, Design Inc has a specialisation in business aviation which as a sector focuses on high end top quality products, services and promoting their associated benefits. We are fortunate to work for blue chip OEMs like Bombardier, FBOs like TAG Farnborough Airport and leading aviation businesses such as Vertis, Elit’Avia and Acropolis Aviation. Acropolis also had a busy EBACE this year with key announcements concerning the engine and interior cabin fit-out contract awards on their new ACJ320NEO executive airliner.